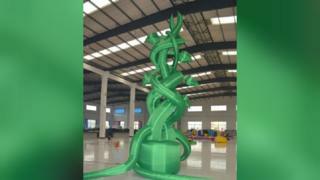 A theatre is asking pantomime patrons to dig deep - for more than magic beans - to replace a giant inflatable beanstalk that went missing in transit. The oversized vegetation never arrived for performances of Jack and the Beanstalk at Angles Theatre, Wisbech, Cambridgeshire, in December. A replacement was found but the theatre had not insured the original shipment, which went missing in Cornwall. It is now crowdfunding to replace the supplier's £3,500 prop. The beanstalk had been ordered from a theatre company in Cornwall but did not make it as far as a distribution warehouse in Exeter. The theatre must now repay the cost of the inflatable to enable the hire company to replace it. Jamie Cook from Angles Theatre said he was not sure how it was possible to lose a giant beanstalk, but thought the label might have fallen off and the inflatable was "probably sitting in its box somewhere". "The Angles Theatre... is one of the oldest working theatres in the UK and a real gem for the town, [but] we are a small charity and this is a large amount of money for us to find, especially at this, our quietest time of year," he said. As it will take more than the fabled magical beans to achieve the giant sum to reimburse the supplier, Mr Cook added: "We have set up a fundraising page to help cover the cost of our missing beanstalk." The theatre has started a crowdfunding page in the hope of raising enough money for a replacement. Video Can this curious British custom charm the US?